Jared Taylor (third from left) with H&D editor Mark Cotterill, assistant editor Peter Rushton, and former MEP Andrew Brons. An apocryphal British newspaper headline supposedly once read: “Fog in Channel – Continent cut off”. This was of course a joke at the expense of insular Britons, in fact according to the historian Niall Ferguson it was first promoted by German National-Socialist propagandists. However as of 2019 the joke is now on Europe’s institutions. On Friday American Renaissance editor and author Jared Taylor was detained at Zurich airport and deported back to the USA. He appears to have been banned from the entire “Schengen area”, which means most of Europe, with the exception of the UK, Ireland and some Balkan countries. In the name of “security”, Europe’s guardians have decided to cut off their citizens from one of the world’s most important writers and thinkers on racial questions. Since the race problem is by far the greatest threat to Europe, the guardians of our security have thus become part of the problem. Mr Taylor – a Yale graduate and author of the classic text on America’s racial crisis Paved With Good Intentions – was changing planes in Switzerland en route to Stockholm for the Scandza Forum, the latest in a series of conferences that have brought together some of the most important European thinkers and activists on racial questions. He had also intended to attend a further conference in Turku, Finland. Jared Taylor speaking at a meeting of the National Capital Region of the CofCC in Washington DC. Seated to his right is the late Dr. Sam Francis. The officer took me to an interrogation room and asked me about my travel plans. He went off to another room for a while and came back with a form for me to sign, saying that I understood I had been denied entry and was being sent back to the United States. After some more waiting, he fingerprinted me and took my photograph. He then turned me over to a man in civilian clothes, who took me to a spare, dormitory-like accommodation where I will spend the night. It’s not a jail. People pay the equivalent of $40 to spend the night here if they miss a flight. I am free to walk around the terminal, I can make phone calls and use the internet, and I have a meal voucher that is supposed to last me for the next 12 hours. The officer kept my passport, though, and won’t give it back to me until I board the flight home. Fortunately the internet means that (for the time being at any rate) Europeans can still access Mr Taylor’s work at the American Renaissance website, and the contributions of other speakers at the Scandza Forum. The multiracial society’s collapse is evident all around us. Those same border security officials who excluded Mr Taylor have utterly failed to protect our continent from the real and continuing threat. On a cold, wet and windy Saturday (16th March 2019) the spirits of German nationalists and campaigners for Truth in History were high as they held a successful public rally in the centre of the historic German city of Brandenburg. Richard Edmonds reports. On a cold, wet and windy Saturday (16th. March 2019) the spirits of German nationalists and campaigners for Truth in History were high as they held a successful public rally in the centre of the historic German city of Brandenburg. Richard Edmonds reports. Standing in the public square amongst crowds of shoppers, with the trams rattling past and with a hundred Lefties positioned just across the street, some forty strong Nationalists campaigned for the release of German patriots jailed for questioning the so-called “Holocaust”. From the nationalist ranks, speaker after speaker denounced the injustice of jailing men and women for the “crime” of asking questions. The high point of our demonstration came when one of the young women supporters read out the message written by the brave Ursula Haverbeck. Frau Ursula Haverbeck recently “celebrated” her ninetieth birthday in her prison cell in Bielefeld jail. Last year Frau Haverbeck was sentenced to multiple years of imprisonment. Her “offence” ? She had asked, Did the “Holocaust” really take place ? The success of our demonstration was confirmed when the local regional television in its evening news programme reported on our “Free political dissidents” campaign. The TV station showed a still photo (above) of our activity together with the broadcast of a two minute rant made by the City mayor (“Christian-Democrat”) happily standing amongst the antifa counter-protesters. Dear German friends, my name is Richard Edmonds. I am British. A few years back a group of us travelled to Brandenburg-Havel in order to show solidity with you at the rally that was held in support of Horst Mahler. Mahler had been locked up in the Brandenburg jail for disputing the so-called “Holocaust”. It is appalling that years later this man who lives for the Truth and who campaigns for the Honour of Germany should be still locked up in prison. The man is 83 years of age, he is suffering from Diabetes, as a result of which both feet have had to be amputated; and still he is not released. When we were previously here, one of the speakers on behalf of Mahler was the very brave Ursula Haverbeck. Now the ninety year-old Frau Haverbeck is herself in jail in the Bielefeld prison. We all know that the Heroine Ursula Haverbeck has campaigned untiringly for years for the Truth and for the Honour of Germany. And so have many others. For example, the lady-lawyer, Frau Sylvia Stolz was also jailed for years in the German Federal Republic, because she too campaigned for Justice and Honour. Frau Stolz was the Defence-lawyer for the German-Canadian, Ernst Zundel, who in the year 2003 was accused in the German courts of “Holocaust”-denial. Zundel’s trial became notorious: the judge in the case, Dr. Ulrich Meinerzhagen, found himself obliged in open court to announce that, and I quote: ”It is completely irrelevant whether the Holocaust took place or not. Denial of the Holocaust is a criminal offence and that is all that matters in this court.” As a result of her energetic defence of her client, Ernst Zundel, Frau Stolz was condemned to several years of imprisonment. Zundel himself was jailed for five years at the Mannheim prison. The pair of them are Heroic patriots. “Were Deckert’s view (interpretation, understanding, grasp = ‘Auffassung’ in the origin) of the Holocaust to be correct, then it would follow that the German Federal Republic would be based on a lie. Every speech made by the President of the Republic, every commemorative minute’s silence, every history book, would be based on a lie. In so far as Deckert denies the murder of the Jews, he challenges the legitimacy of the German Federal Republic.” Frankfurther Allgemeine Zeitung of August 1994. Dear Friends, I would like to say here that you are not alone. World-wide you have admirers for your campaign for the historical Truth. For example, the British historian, David Irving, had to stand trial in Vienna for what Irving had said earlier about the Auschwitz camp. Irving was condemned by the Austrian court to three years’ imprisonment. Last year in London, the world-famous French historian, Professor Robert Faurisson gave an hour-long talk before a large and enthusiastic audience over his epoch-making research into the “Holocaust”. As a guest here in Germany, I cannot do more than quote the former judge of the German Constitutional court, Judge Wolfgang Hoffmann-Riem: “I would not make Holocaust-denial a criminal offence,”: Judge Hoffmann-Riem, as quoted in the Tagesspiegel of the 10th. July 2008. Finally, friends, as a foreigner here I can only say that one bows the head before such German Heriones and Heroes who have had to suffer for years because of their love for their Fatherland. ‘Sophie Johnson’ and Alison Chabloz – Hope not Hate informants – celebrating the criminalisation of ‘Holocaust denial’ this week. Yesterday in Southwark Crown Court, Alison Chabloz was again found guilty of posting “grossly offensive” YouTube videos, in contravention of the Communications Act 2003. This reaffirmed the verdict of District Judge John Zani, sitting last May in Marylebone Magistrates Court, who had found Chabloz guilty on three charges of “sending grossly offensive communications via a public communications network”. This week Judge Christopher Hehir, sitting alongside magistrate Mena Rego (a Kenyan Asian immigrant and Roman Catholic school governor), reimposed exactly the same sentence as Judge Zani had passed last year: a 20-week suspended prison sentence, plus 180 hours of unpaid “community service”, plus a 12 month ban from social media. So for Ms Chabloz, the outcome of her “appeal” (actually a full retrial of the facts, rather than an appeal on points of law), was unchanged. She (or rather her donors) will probably face a heavy costs bill for having pursued an unsuccessful retrial – especially after the prosecution instructed a QC for this retrial – but otherwise exactly the same verdict and sentence. For UK historical revisionists and political activists, however, this week’s Crown Court judgment is far more serious. That’s because the earlier court judgment could not set a precedent: it applied only to Ms Chabloz’s particular case. Richard Edmonds warned in an article for the Heritage & Destiny website published on January 2nd – ‘Does Alison Chabloz know what she’s doing? Or criminalising “Holocaust”-revisionism by the back door’. Mr Edmonds’ warning has been fully vindicated this week. Lady Michèle Renouf, Richard Edmonds and Dr James Thring commemorating the Dresden Holocaust. Mr Edmonds (and H&D) were severely criticised for these observations. Ms Chabloz’s right-hand-woman – a Hungarian lady who uses the name ‘Sophie Johnson’ – sent Mr Edmonds an impertinent email calling him a “dotard” who had produced “stupid burblings” and “ugly bile”. Yet the outcome this week has been precisely as Mr Edmonds warned. For more than thirty years, Jewish lobby groups have been frustrated that the UK has stood apart from a general European trend towards criminalising ‘Holocaust’ revisionism, which they like to term ‘Holocaust denial’. In one form or another, most European countries outlaw the expression or publication of views which dare to question the established historical orthodoxy: that six million Jews were killed, mostly in homicidal gas chambers and mostly in concentration camps, during the Second World War, on the orders of Adolf Hitler and other senior figures in Germany’s National Socialist government. Professor Robert Faurisson and Fred Leuchter were targetted by London’s Jewish lobbyists in 1991. Fred Leuchter was duly arrested and deported from the UK, but there was no legal means of excluding Prof. Faurisson (a dual French-British citizen), and despite continual lobbying there has never been any anti-revisionist law in this country. In 2008 there was an attempt to ban revisionism via the backdoor method of the European Arrest Warrant system. German authorities issued an EAW leading to the arrest of Australian revisionist Dr Fredrick Toben, who was seized from a plane while in transit at London’s Heathrow airport and locked up in Brixton prison awaiting extradition to Germany, where he would have faced imprisonment for ‘crimes’ that are not illegal in this country. After the last-minute mobilisation of a legal team by Lady Michèle Renouf (acting on timely information from Dr David Duke) the authorities’ attempt to extradite Dr Toben was blocked. This meant it was impossible for European courts to extradite Bishop Richard Williamson or other historical revisionists living in Britain, such as the French author Vincent Reynouard. Solicitor Kevin Lowry-Mullins outside the City of London Magistrates’ Court during the successful action to overturn a European Arrest Warrant against Dr Fredrick Toben in 2008. During parliamentary discussion of the European Arrest Warrant system, several well-informed members of the House of Lords had criticised European laws restricting free historical research. Israeli-funded lobbies realised it would be difficult to pass a UK version of such laws through Parliament, and that even making the attempt might cause unwelcome scrutiny of the entire Holocaust story. In the UK, law can be made either through Parliamentary statute or through case-law precedent. In most cases of Holocaust revisionism, it is difficult to obtain a conviction using the race laws, since they demand evidence either that the words concerned were intended to stir up racial hatred, or that in all the relevant circumstances racial hatred is likely to be stirred up. Sometimes an element of ‘Holocaust denial’ can be bundled in with a wider set of charges against a ‘racist’ publication, as was the case in 1998 when Nick Griffin and Paul Ballard were convicted at Harrow Crown Court for editing and publishing a magazine called The Rune. But in most cases this avenue would have little chance. Jewish activists looked instead at the Communications Act, which is the latest version of a law dating back before the Second World War, and originally intended to criminalise “grossly offensive” telephone calls. There is a technical legal question as to whether this law even applies to the internet (and in particular to YouTube), but assuming prosecutors could succeed with that technical argument, all they needed was a form of historical revisionism that could plausibly be portrayed as “grossly offensive”. A couple of Chabloz’s anti-Zionist songs were posted on YouTube in 2016, attracting complaints from the Campaign Against Antisemitism, a charity funded by Jews who believed their community’s leadership was too ‘soft’ on their enemies. CAA pursued a private prosecution, but at this early stage it seemed possible that the case could be won. Brave lawyers agreed to take on Chabloz’s defence, despite the pittance paid by legal aid and the bad publicity they would attract. During 2017 and 2018 Chabloz repeatedly damaged her own defence, for example by uploading an additional song (while on bail) which was both non-revisionist, or even anti-revisionist, in singing about soap, lampshades and other long-discredited aspects of the Holocaust myth; and more blatantly “grossly offensive” within the meaning of the Communications Act, since the words suggested that one should wish that Jewish children had indeed been turned into soap, lampshades, etc. As her trial proceeded early in 2018, Chabloz launched an extraordinary tirade against her own sole defence witness Peter Rushton. After she received a light sentence at Marylebone Magistrates, she decided to escalate the case at a higher legal level. The only thing this was likely to achieve was to establish a precedent that (in certain circumstances) criminalises Holocaust denial in the UK. Notorious Jewish gangster Jack Spot was among the Jewish thugs who attacked lawful British natonalist events in the 1930s and 1940s. A veteran of the ’43 Group’ gang was present to celebrate the Zionist victory in Southwark Crown Court this week. So where do we now stand. The judgment will be closely analysed by lawyers in the coming weeks, and we should bear in mind that (so far) the precedent is ‘persuasive’ rather than ‘binding’. If the case proceeds further then on certain points of law a ‘binding’ precedent could be set, which would of course be even worse news! However at first sight it seems that revisionists – even in the UK – have now been placed in one respect in an equivalent position to their German colleagues. Just as the German courts refuse even to consider revisionist arguments, a British criminal court now (for the first time) regards the “historical fact of the Holocaust” as “undoubted” – or as the German courts put it, “manifestly obvious”. It has always been the case that revisionists (just like racial nationalists) have had to take care that their words would not be seen as likely to “incite racial hatred”. But now the criminal bar has been substantially lowered. Revisionism no longer needs to incite hatred to be prosecutable, it can merely be “grossly offensive” – and it is accepted that anything deemed grossly offensive to Jews should be deemed by the law as grossly offensive to the general public. The effect of the Chabloz case has therefore been to shift the goalposts considerably to the benefit of organised Jewry and International Zionism, and much to the detriment of free historical research. The only reason why any aspect of this case this has become a ‘persuasive’ legal precedent, endangering both native Britons and fugitive European revisionists, is that Ms Chabloz’s vanity (or worse) caused her to escalate the case above the level of Magistrates’ Court where it would otherwise have remained. Richard Edmonds (and the anonymous author of an article circulated in 2017 by Agence Bocage) are fully vindicated by this week’s developments. Alison Chabloz and her chief crony ‘Sophie Johnson’, motivated by spite or perhaps something worse, acted as informants for the ‘antifascist’ organisation Hope not Hate, disrupting the final meeting addressed by the late Prof Robert Faurisson in his Shepperton birthplace last October. That disgusting betrayal already put them beyond the pale. This week’s disaster is arguably even worse. Alison Chabloz has succeeded in criminalising revisionism (at least in certain circumstances). Those (including at one time ourselves at H&D) who have afforded her financial and other assistance should examine their consciences. On Friday 25th January 2019 in the historic city of Vichy, a lunch attended by sixty guests from around Europe commemorated the 90th birthday of the great scholar and brave champion of historical exactitude, Professor Robert Faurisson. That day would have been his 90th birthday. Professor Faurisson died on 21st October last year, immediately after returning to Vichy from a conference in his birthplace of Shepperton, West London, hosted by H&D‘s assistant editor Peter Rushton, Lady Michèle Renouf, and Western Spring. At the Vichy luncheon, Italian tenor and veteran of the Gaza flotilla Joe Fallisi (who organised the event), together with Professor Faurisson’s right-hand man Guillaume Nichols and Lady Renouf, awarded the inaugural Robert Faurisson International Prize to the great German lady Ursula Haverbeck, heroine of the campaign for truth and justice. Joe Fallisi and Lady Michèle Renouf (who together with Guillaume Nichols were the adjudicators for the 1st Robert Faurisson International Prize) present the award to Ursula Haverbeck’s Berlin attorney Wolfram Nahrath. Frau Haverbeck, though 90 years old, is presently incarcerated in the German city of Bielefeld, serving a prison sentence of more than three years for the ‘crime’ of politely questioning historical orthodoxy. For this reason, she was unable to travel to Vichy to collect the award in person, but was represented by her Berlin attorney Wolfram Nahrath. Speakers at the luncheon included Jerôme Bourbon, editor of the journal Rivarol. We shall later publish an edited video of the Vichy event: exiled French revisionist Vincent Reynouard has already published his video report (click here to view – in French). Intense lobbying at the highest level of British politics was behind the official disruption of a revisionist meeting in November 1991, hosted at Chelsea Old Town Hall by the British historian David Irving with speakers including the late Prof. Robert Faurisson and Fred Leuchter. The extent of this high-level lobbying can now be revealed after H&D accessed newly released documents from then Prime Minister John Major’s Downing Street files. At previous such meetings, Jewish leaders had prioritised matters affecting Israel and the treatment of Jews in the Soviet bloc: now, for the first time in the postwar records of such meetings, “anti-semitism” within the UK was the top priority, alongside historical revisionism. A meeting was arranged for November 19th at Downing Street. This was in the context of British historian David Irving’s increasingly outspoken revisionism – Irving had published and contributed a foreword to a British edition of The Leuchter Report in 1989, based on research carried out at the alleged extermination camp complex of Auschwitz-Birkenau by American execution technology expert Fred Leuchter. The revisionist critique of orthodox ‘Holocaust’ history had been gaining ground since the 1970s, largely thanks to the pioneering scholarship of the French expert in documentary analysis, Prof. Robert Faurisson, and the American Professor of electrical engineering Arthur Butz. During the 1980s revisionism attracted enormous publicity thanks to the work of the Institute for Historical Review in the USA, and especially due to the efforts of German-Canadian artist and publisher Ernst Zündel, who faced multiple criminal trials in Canada and was eventually deported to Germany – spending a total of seven years in Canadian and German jails for the ‘crime’ of questioning historical orthodoxy. It was in this context that the Board of Deputies (backed by senior backbencher Sir John Wheeler, who chaired the House of Commons Home Affairs Committee) asked Major’s Home Secretary Kenneth Baker to use his powers to exclude Leuchter and Faurisson from coming to Britain as guests of Irving, who intended to put on a series of revisionist meetings. The same considerations applied when Robert Faurisson made later visits to London – including 1998 when he addressed a meeting in Croydon organised by Paul Ballard before testifying for the defence at the trial of Mr Ballard and Nick Griffin; 2008 when he spoke at a meeting organised by Lady Michèle Renouf following the historic legal victory over the German government in a failed extradition case against Dr Fredrick Töben; and last year when he spoke at a meeting hosted by H&D in his native town of Shepperton the day before his death. 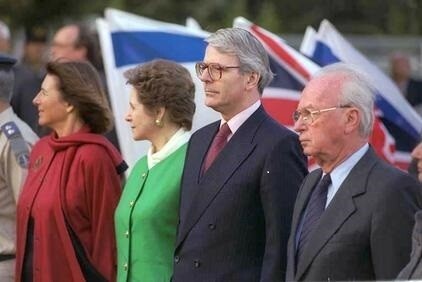 Kenneth Baker, the Home Secretary who ordered Fred Leuchter’s exclusion from the UK, seen here at a Tory Party conference with John Major’s predecessor Margaret Thatcher. “The Home Secretary may personally direct that an individual be excluded from the United Kingdom if his presence is deemed not to be conducive to the public good. This power is used very sparingly and only after the arguments in support of free speech have been very carefully weighed against those on the undesirability of giving a platform to objectionable views and the risk of public disorder. In the recent case of Leuchter the Home Secretary felt it would cause grievous offence both to the Jewish and non-Jewish community if he was admitted to the UK and, therefore, decided that he should be excluded. The contradiction in Downing Street’s position is evident: while accepting it would be “very undesirable” to exclude people from the UK merely for expressing “offensive, but not unlawful” views, these same officials were happy to recommend the exclusion of Leuchter and (had it not been for his dual French-British citizenship) Faurisson as well. Neither of these gentlemen could be credibly presented as a threat to public order. On January 19th five officials of the Board of Deputies led by Judge Finestein duly met with Prime Minister Major. According to official minutes now released to the National Archives: “Judge Finestein made it clear that the Board regarded the meeting as private; the members present would not talk to the Press afterwards. Robert Faurisson speaking at the Chelsea meeting raided by London police on 15th November 1991. Just four days before this Downing Street meeting, Metropolitan Police officers had raided a meeting at Chelsea Old Town Hall, chaired by David Irving, with speakers including Robert Faurisson and Fred Leuchter. The packed audience included BNP leader John Tyndall and his right-hand man Richard Edmonds, as well as H&D‘s Assistant Editor Peter Rushton. Leuchter was ordered to leave the stage a few minutes into his speech, and was hauled off to a nearby police station where he was held overnight without charge, then deported on a flight back to the USA the following day. A few weeks after this Chelsea meeting, French National Front leader Jean-Marie Le Pen visited London where he addressed a dinner at the Charing Cross Hotel hosted by a conservative group called Western Goals, whose officials included the late Jonathan Bowden. Special Branch listed what they described as the “main anti-semitic organisations” in the UK, but aside from the BNP, National Front and League of St George most of those listed were (to H&D‘s knowledge) little more than one-man bands or non-existent organisations invented as fronts for the distribution of certain literature. The file highlights the successful prosecution of Lady Birdwood earlier that year, and an ongoing case against Colin Jordan, Britain’s best-known national socialist. In addition to their specific concerns about revisionism, the Board of Deputies were lobbying at this time for further strengthening of Britain’s race laws, and had revived their call for a ‘group defamation’ law. The next edition of H&D will contain a detailed analysis of this lobbying effort, exposing the continuing campaign by this powerful lobby group further to restrict Britons’ traditional liberties. Unsurprisingly, part of the 1991 delegation to Downing Street was Neville Nagler, chief executive of the Board of Deputies, who in his earlier career as a Home Office civil servant had been partly responsible for the drafting of Britain’s developing race laws. Nagler was a prime example of the so-called ‘revolving door’ syndrome, where a politician or civil servant steps down from his role in government, only to re-enter the same public buildings as a lobbyist for special interest groups! I would like to comment on my stay in London that evening. I was removed by a very friendly police department (all wishing to shake the hand of a man who makes execution equipment) and was treated well by the station Superintendent whom personally conveyed my wife to the Chelsea station. I was allowed to remain in the lobby with my wife until the shift changed at Midnite. The second shift Superintendent did not know what to do with me, but did not want me cluttering up his lobby. Thereafter, I was thrown into a cell with a psychopath who was in for assault, but who happened to like me. I was then removed to a cell with a petty thief for fear that I would be injured in the cell with the former. At 2 AM I was removed by two of Her Majesty’s Immigration Officers who interrogated me under a hot bright light. It looked a scene from a B Movie. I was returned to my cell and returned for the “Third Degree” two more times. I requested to speak to the US Consul or Ambassador but was refused. Her Majesty’s Idiots taped everything. At 6 AM I was again removed from my cell by a third Bureaucrat who advised me that he did not particularly like me but that my rights had been violated by the earlier interrogations and being held incommunicado. He told me that their plans were to deport me to France (after 18 days) who would deport me to Belgium (after 18 days) who would deport me to Germany (after 18 days) who would finally deport me the USA (after 18 days). Apparently International Law allowed me to be held for 18 days for investigation. The new Her Majesty’s agent was really upset when he heard the tapes of my interrogation and felt that British Law was being violated by Her Majesty’s earlier Buffoons, and he intended to right this wrong. I was taken into custody by two British Policemen who put me on an Airplane (at Her Majesty’s expense) and sent home. To say the least, it was a very interesting evening. “Lord, what fools these mortals be.” Shakespeare’s A Midsummer Night’s Dream, Act 3, scene 2. As always in appealing to a higher court against the findings and sentencing of a lower court, there is the risk that, as in the case of Ms. Chabloz, the suspended prison sentence of some weeks’ duration (i.e. at “liberty” but subject to certain conditions), is regarded as too indulgent by the higher court which then hands down an actual prison sentence of months – months locked up in a concrete cell in close proximity with criminals and various other anti-social types. Taking the risk of appealing against the findings of a lower court is always a very personal matter. For legal reasons no comment is made here on the merits or demerits of the case itself. What is under examination here are the tactics and implications of taking the case to a higher level of the court system. Because, what is not a personal matter in the case of Ms. Chabloz, is what the consequences of her decision to appeal might be for the Revisionist movement here in Britain. That is the question. As the law stands, the findings of a Magistrates’ court are not regarded as setting any legal precedent. This is not the case with the findings of a Crown Court. It is not impossible that should in February Ms. Chabloz lose her appeal at Southwark Crown Court, then her case, involving as it does elements of the so-called “Holocaust”, could be used as a legal precedent to launch criminal prosecutions against Historical revisionists by the back-door, so to speak, in the absence of any formal laws in Britain banning “Holocaust”-denial. This is not some idle theory and speculation. Recently the brave French revisionist and refugee from French “Justice” currently residing in Britain, Vincent Reynouard, raised the whole question of the possible consequences of Ms. Chabloz‘ appeal. In an interview that he gave to the highly regarded nationalist and revisionist, French-language publication, RIVAROL (12. December 2018), Reynouard expressed his fears. Referring directly to the case of Alison Chabloz in Britain, Vincent Reynouard asked, “who says that her case may not create a legal precedent ?” Reynouard reminded the readers of RIVAROL how the judicial authorities in North America had employed legal pretexts to arrest Ernst Zundel and Germar Rudolf in order to extradite the pair of them back to their land of origin, where both were immediately jailed for many years. Reynouard stressed that the possibility cannot be excluded that he might get the same treatment. Question: Does Ms. Chabloz know what she is doing ? On the occasion of Ursula Haverbeck’s 90th birthday, six hundred German Nationalists paraded through the North German town of Bielefeld where the brave Revisionist is currently incarcerated for the expression of her non-violent views questioning the “Holocaust”. Speakers at the concluding rally included our friends Thorsten Heise and Nikolei Nerling, the Volkslehrer. Letters and cards of support can be addressed to: Ursula Haverbeck, JVA Bielefeld-Senne, Bielefeld, D-33649, Germany. According to a report posted this evening on the Guardian website, Britain’s security service MI5 is taking over responsibility for “combating extreme rightwing terrorism amid mounting fears that white supremacists are increasing their efforts to foment violent racial conflict on Britain’s streets”. Until now, although MI5 maintained a small section monitoring the ‘far right’ from a counter-subversion angle, most state monitoring of such movements has been handled by the police, specifically Special Branch and its successor SO15. For example the vast majority of operations against the ‘far right’ have involved public order questions surrounding demonstrations and marches by the likes of the English Defence League. ‘Anti-terrorist’ operations in this area have (until now) involved mainly connections between racial nationalists in the NF or BNP and Ulster loyalist paramilitaries. As distinct from a range of police responsibilities to combat crime and preserve public order, MI5’s responsibility involves serious threats to national security. It is an extraordinary tribute to the failure of the multicultural experiment that racial nationalist groups are now deemed to fall into this category! Contrary to the Guardian‘s implication, it is not unheard of for MI5 to take an interest in British racial nationalism. H&D has just finished serialising a detailed analysis of MI5’s files on British Movement founder Colin Jordan, dating from the 1940s to the end of the 1960s, while far more recently an MI5 agent operated inside a moribund splinter from the National Front, the late Ian Anderson’s ‘National Democrats’. Several European countries have long-established sections of their security / counter-subversion services specialising in the ‘far right’. MI5 will hope that they fare better than their colleagues in Germany’s BfV, which has lost two directors in recent years due to scandals surrounding its handling of the ‘far right’. I am here in Munich on the first day of the Schaefer trial (of the Canadian-born Monika and her German-born brother Alfred). Upon my arrival at the Munich courthouse this morning, my attorney RA Wolfram Nahrath ( who also acts today for Monika Schaefer) advised me not to remain in the courthouse building (much less enter the courtroom) as likely the same trick will occur upon me as played when the German police seized Monika (while she attended the former attorney Sylvia Stolz trial on January 3, 2018). This was when the judge interrupted that hearing to have Monika dragged off from the public gallery to the cells (for these past 6 months) to the Munich Prison and likely could be repeated today once court officials spotted me, as he says they certainly would, in the public gallery. Since February this year, I have been under criminal investigation having been charged with Volksverhetzung para 130/ populace incitement which carries a five years’ custodial penalty following my ad-libbed speech at the Dresden Commemoration. Wiser, our attorney says – but my call – that I leave immediately the risky vicinity to instead make reports from a nearby cafe. The parties provide me with a full account during the intervals of the day’s proceedings – as a more useful option especially as I not able to comprehend German language proceedings in any case if witnessing the process. I decided to take my attorney’s advice as a more effective option (than uselessly being hauled off to a prison cell) and so am now sitting with Henry Hafenmayer as he is not allowed inside the courtroom at this time. Henry awaits being called as a witness for the Prosecution for being considered as the video maker (though in fact, he was not Monika’s video maker). Though Scientist of Law Sylvia Stolz warmly thanked me for coming to show “international affection for the Schaefer siblings” she agrees that my making daily reports to include this advice, as given by my own attorney, in fact serves to strengthen the dramatic resonance of the situation Alfred and his sister Monika are facing in this bewildering “Alice in Wonderland” anti-National, non-Sovereign German legalese-land where – ‘first we have the verdict’ then maybe or maybe not we hear the defendants’ evidence. How else but bewildering can one assess the nonsensical norm for WW2 historical sceptics where lawyers risk prosecution themselves if they defend certain clients’ opinions and findings “too well”? During trials conducted in Mannheim Court, I have personally witnessed the lawyers acting for artist and publicist Ernst Zündel, and Planck Institute graduate and chemist Germar Rudolf, finding themselves charged for “acting too well” for their historical revisionist clients. Indeed, some of those German lawyers have been punished with either crippling fines or incarceration for defending their clients “too well”. Alfred is set upon screening in the courthouse the full story of his political awakening via the suspect videos. I am only anxious that the judges may manage to forbid this exposé by him. The great disadvantage here in Germany is that no transcripts are made of these Processes. I shall do my best to give you the proceedings as provided to me from the horse’s mouth. Day one began at 09.15. The following was reported to me by valiant former-attorney Sylvia Stolz. Before the entrance of the two professional judges and the two lay/Schöffe judges, Alfred was able to hug his handcuffed sister while the Press photographed them. Judge Hofmann and Judge Federl entered with the two lay/Schöffe judges but Alfred refused to stand in any acknowledgment of their authority. To this, the judges declared Alfred’s disdain as an offence to the rules whilst Alfred declared them and the Federal Republic of Germany illegitimate since he adheres to the standing legitimacy of the German Reich. Alfred was told if he offended again he would be heavily fined for complaining that the proceedings were inaudible to him and to the public gallery because Judge Hofmann had ordered that the attorneys not press the live microphone buttons. This instruction wilfully denies due public access to hear the proceedings. When Alfred commenced to read his introductory remarks, the Judge demanded he give only a summary. At this, his attorney and Monika’s called for an interruption for two hours in order to draw up a rejection of the sitting judges whom they declared patently prejudicial to the defendant’s right to express his defence in full. The “Holocaust”-denial laws adhere to those of the playing-card Queen’s in Alice in Wonderland wherein these “contrariwise” trials commence with “Sentence first – then the evidence”….unless one’s lawyer attempts to defend his/her historical revisionist client “too well” and then the lawyer also is prosecuted for “defending the client too well”. The “Holocaust” exceptionalist law presumes not only a bottomline of “obviousness” but also that any attempt by the lawyer to offer his/her client’s evidential exhibits to prove the case will be “criminalised” as a heretic and suffer incarceration. Attorney Nahrath and others are always dancing on the wire. No wonder historical Revisionists are called religious heretics since the International Guidelines for Teaching About the “Holocaust” on page 11 determine that: “Care must be taken not to disprove the deniers’ position through normal historical debate and rational argument”! Even in the Allied occupier’s land of Britain, not since 2008 has the BBC permitted another World Service broadcast under the title “Why Can’t We Question the Holocaust?” In this unique broadcast, when I and Jewish Prof Deborah Lipstadt were invited as the main guests, on this hour-long worldwide phone-in radio show, has the public had the normal opportunity to hear some of the Revisionist victories presented (by Renouf, much loathed by Lipstadt) instead of the omnipotent Hollywood version of WW2 history. Ever since the German ex-Constitutional Court Judges Hassemer and Hoffmann-Riem called for the repeal of the “Holocaust”-denial laws, there have been numerous attempts to enlighten and embolden the law-makers and law-proponents in today’s Germany. These ex-Constitutional Court Judges argued that the “Holocaust” denial law was in contrary yo the Federal Constitution of the Bundesrepublik! Notably these valiant attempts in Germany and Austria were made by the late greats Ernst Zündel, Dr. Herbert Schaller, RA Manfred Roeder, RA Jürgen Rieger, Gerd Honsik – and Horst Mahler, Sylvia Stolz, Germar Rudolf, Udo Walendy, Henry Hafenmayer, Dr Rigolf Hennig, Werner Keweloh, Dr Hans Berger, Günter Deckert, Wolfgang Fröhlich, Ursula Haverbeck, Arnold Höfs, Sven Lobeck and Christian Haeger to name but a few. Today’s opportunity by Alfred and Monika Schaefer may justly capture the global tidal wave for this anti-debate law to be called into question and repealed. Meanwhile, persons in the public gallery (only about 8-15 which included two reporters from Japan) have recognised some of the Press as Antifa whom they recall from Pegida demos. There are about 6 in the Press benches, and one from Bild the popular scandal sheet. The SCHAEFER TRIAL in MUNICH,Day 1, AFTERNOON SESSION Monday July 2nd, 2018. The trial resumed at 12.30 following the two hours’ interruption while the attorneys for Monika and Alfred Schaefer filed a demand that the Chairmen of the four judges, Judge Hofmann, be removed from the Process because of his evident bias against the Defendant Alfred Schaefer. The Chairmen ruled that the trial would continue under his authority until Wednesday July 4th when the matter would be weighed. The afternoon’s session commenced with the assistant of the State Prosecutor (who was not named) handing Alfred an arrest warrant which meant he must be taken into police custody (not jailed as such) until the Judge decides on the new case of para.86 against him. Monika Schaefer achieved her common-sense input when, after she persisted that she and the public gallery could not hear the proceedings, Judge Hofmann finally permitted microphones to operate. By now already the day’s session was half over! Alfred gave a four hour well-documented presentation of why the Federal Republic is illegitimate. The Judge complained at the “broader horizon” of the matters Alfred included. His 77 page statement was shortened to 65, yet even so, observers said Alfred pulled no punches with his historical and current accusations in support of his appeal for the dismissal of the case brought against him and his honourable sister. At the end of this, after which the Judge had declared that Alfred must be detained in police custody (as opposed to jail) because of his suspect gesture, Sylvia Stolz exclaimed (but not to the judge) that the Process was unbelievable: “This is terror”. After all, Alfred’s disdain of Federal Republic law was of the essence to his own defence! When Sylvia then declined to explain to the Judge (to whom she had not directed her outrage) about what, perhaps, she meant by inquisitional terror, she simply said “I am lost for words”… as were the stunned public gallery who had never before witnessed such surreal “ criminal” events. By now Attorney Wolfram Nahrath had removed his robe since the Judge had ended the day’s session. Yet the Judge insisted Sylvia Stolz had interrupted the proceedings rather than made her outcry allowable after the afternoon session’s end. Sylvia was then given two days in the cells for contempt of court. Oddly, the Judge failed to offer her the usual option of a fine. Some in the public gallery wondered that perhaps no such option was given in order to preclude Sylvia’s perspicacious presence during the coming days. The State Prosecutor refused the request from Attorney Nahrath for the Schaufer siblings to have a few moments to say goodbye. But the Judge decided by himself to give Monika Schaefer permission to have five minutes with her brother. He instructed the court clerk to note the Protocol that first the public gallery must leave the courtroom, presumably to avoid experiencing empathetically the moving pathos they would witness passing naturally between these truly loyal siblings. The trial continues at 12.30 on Tuesday 3rd July. The SCHAEFER TRIAL in MUNICH,Day 2, AFTERNOON SESSION Tuesday July 3rd, 2018. This morning, Tuesday July 3rd 2018, on Day Two of the Schaefer sibling’s trial, we learn that the period of punishment for Alfred (under para 86a) who was taken yesterday into police custody is over for the time being. After today’s session he will be permitted to return home. Alfred now has this further trivial case to face later in the lower court. Alfred, ever-feisty, has now been offered the option of bail of 5000 euros to secure his release, though he will have another ludicrous action taken against him for a suspect gesture! He also had to surrender his passports – quite as if he could ever be a ‘flight risk’ as a man completely determined to face down what he considers are his country’s traitors and those swindle-speakers responsible for the “contamination” of its citizens’ capacity for rational, healthy hatred of sociopathic depravity and corruption. The trial resumed this afternoon at 12.30. Monika’s veteran attorney Wolfram Nahrath will be presenting his 22-page argument against Para 130 of the law Volksverhetzung/populace incitement in which he will raise the precedent of the two ex-Constitutional Court Judges Hassemer and Hoffmann-Riem who, in 2006, called for the Repeal of this “ Holocaust”-denial law based on heresy values versus scientific attitude (our Hellenic scientific attitude versus the “Holocaust” anti-rational argument Teaching Guidelines). Tomorrow we shall learn whether the lead Judge Hofmann will have to step down because of his evident bias against the defendants. The disdain of this Judge for withholding due microphone use so both defendants and the public gallery could hear the proceedings, and the ruling over the norm of a ready glass of water for defendants, are but two of the ‘contrariwise’ obstructive aspects to the due basic rights of all citizenry. These mocking obstructions give further surreality to the conditions under which Germans and foreigners must encounter under the Basic Laws in favour of prosecuting the expression of free opinion among citizens and right to discuss normal historical source criticism without legalese-protected exceptionalism. Before court prooceedings got underway, Alfred’s attorney Frank Miksche learned that Judge Hofmann was not to be removed for bias, for he was judged (from above) neutral since all judges are presumed to uphold his attitude when serving this exceptionalistic law. The question is: Is this law in accord with the Constitution? The case must go up to a higher court in hopes of addressing this. Even so, RA Miksche caught Judge Hofmann out as the latter had made a wrong statement. That is, Alfred had not given him permission to accept a shorter version of his Defence presentation to a mere 20 pages from the original 77. Nor was Alfred prepared to permit cherry picking from his videos rather than have the court watch his videos in full. Alfred is to have his videos duly viewed in full in the courtroom tomorrow (Thursday). During the morning session it was Monika’s turn to tell of their family dynamics. In the afternoon session, Alfred endorsed his sister’s closely shared upbringing and adventurous hang-gliding near-death experiences which served, as such brushes do, to stir one to do or die the way one goes henceforth. The threat of blindness served to embolden him. A fertile civic-minded atmosphere in which the sibling’s sense of fairplay and loyalty thrived is indeed the prompt for their forthright approach conscientiously to live their lives. The Process, as public gallery eyewinesses remarked, had turned to matters emotional. And when the State Prosecutor criticised Monika’s attorney RA Nahrath for introducing an emotional tone, surprisingly the Judge chastened her (whose name we are not told) not Nahrath. Eyewitnesses in the public gallery say they felt the siblings spread an aura of uplift in the courtroom. Alfred says he wished to convey this by his various telling of personal life-threatening experiences – for instance, how his doctor brothers acted to save his impending blindness in the left eye. From such frequent tests, Alfred believes he has “got guardian angels” which make him fearless in the face of all adversity – a formidable opponent to those who rely for their identity on a group sense of god-awesomeship. Alfred the Siegfried who knows no fear! Just the chap Wagner had in mind when he said in 1871 that German unification already needed fearless emancipation from such god-awful influences. For Alfred and Monika, nature and thoughts are to be explored, not tyrannised. He said his father had received the Order of Canada for his services as a medic to the welfare of the Arctic people in recognising the way they live their lives affects their health. One might say Alfred and his community-spirited sister do the same in their way with the influences prevailing over what he calls “the gate keepers”. The Gate-Keepers is the chief video he plans to screen for the court today. I have just this very moment received a call from Alfred alerting me to rendezvous at yesterday’s venue where I shall find out for you, all that has transpired today! Alfred Schaefer and Scientist of Law Sylvia Stolz see each freed after being taken from the courtroom under police custody! Yesterday at end of the day’s session, separately Alfred and Sylvia set off to meet me in the Löhenbräukeller beer garden to discover – to each other’s surprised delight – that each has been released! They had last seen one another being taking into police custody directly from the courtroom. Suddenly, to their mutual satisfaction (see pic attached), they find out they had been, unexpectedly, freed. Having committed no actual harm (i.e. no crime which is an act not a thought!) whatever, why would they be treated as criminals at all? We all here hope for this outcome today for civic-conscientious, harmlessly intelligent, good-natured Monika – release from Munich’s high security prison after six months’ abuse for a benign, videoed apology: “Sorry Mum I was Wrong about the Holocaust”. As it happened, Sylvia and Monika had travelled in the same police transfer van to the prison though they had little chance to speak owing to the noise of the others surrounding them. However, Sylvia found, during the hour when inmates can make their walk that fellow prisoners told her “how much they all love Monika”! At the close today’s court session, I have arranged to record an important interview with Scientist of Law Sylvia Stolz. I will be asking her to explain in a nutshell, why the Federal Republic itself is illegitimate. Ex-Constitutional Court Judges Hassemer and Hoffman-Riem are quoted in my 2006 “Ernst Zündel Unbowed” Telling Film that the “Holocaust” denial law is even contrary to the Constitution of the Federal Republic! This is surely the cornerstone of Alfred’s case and the world needs this chance to grasp it …before it can fall…. for he and Monika are intend on emboldening that day. This week’s 4 days’ trial sessions will pause and return for the concluding dates of 12, 13, and 16 of July. Beforehand I shall be making available the feisty interview with Alfred in his garden; and the interview I am about to make with Sylvia the Scientist of Law on that key to Germany’s sovereignty, that graspable cornerstone. Greetings all: today at 2pm at the home of Alfred Schaefer he and I had just finished watching and discussing matters re his videos he was succeeding to screen in full in the Munich courtroom …and then his wife laid table for lunch after I removed my Laptop …and so I went to wash my hands. I then heard Police knocking on my bathroom door announcing their arrival. It was as if one were suddenly in a nightmare Hollywood movie about a police state action! At first I thought maybe high-spirited Alfred was playing a joke. On opening my bathroom door, there stood 2 armed officers awaiting me. I handed over my passport; they said they’d come to arrest Alfred. I saw 5 of them handcuff my host. Taking with him the little packed cheese lunch his experienced wife swiftly made and handed to one officer for her husband, Alfred was hauled away for reasons the police declined to explain to me. Possibly it was about something he had perhaps said when yesterday he had duly turned up at the police station, as he has to do twice per week since he is out on bail. Whatever this “crime” was, he’s again in a police cell now. His wife advised that I and HH should disappear asap in case police returned knowing now that we two were there, easy to haul in for good measure. Vot a business. Cat and mouse – but at least valiant Frau Schaefer made sure we each retrieved the cheese! The Inquisition of Alfred and Monika Schaefer – Part 1 from NS VIKING on Vimeo.